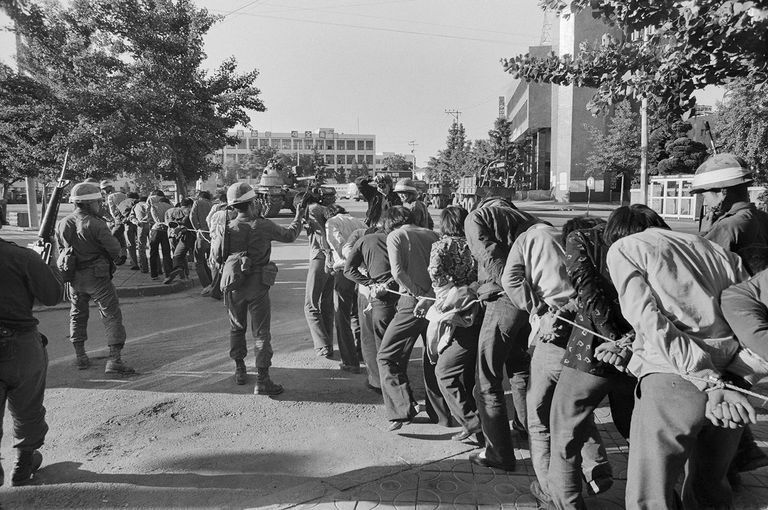 Tied to a rope, arrested students are led away by ROK Army soldiers on May 27th, following a raid by troops in the riot-torn city of Kwangju. Tens of thousands of students and other protestors poured into the streets of Gwangju (Kwangju), a city in southwestern South Korea in the spring of 1980. They were protesting the state of martial law that had been in force since a coup that previous year, which had brought down the dictator Park Chung-hee and replaced him with military strongman General Chun Doo-hwan. As the protests spread to other cities, and the protestors raided army depots for weapons, the new president expanded his earlier declaration of martial law. Universities and newspaper offices were shuttered, and political activity was banned. In response, the protestors seized control of Gwangju. On May 17, President Chun sent additional army troops to Gwangju, armed with riot gear and live ammunition. On October 26, 1979, South Korean President Park Chung-hee was assassinated while visiting a gisaeng house (Korean geisha house) in Seoul. General Park had seized power in a 1961 military coup and ruled as a dictator until Kim Jae-kyu, the Director of Central Intelligence, killed him. Kim claimed that he assassinated the president because of the increasingly harsh crackdown on student protests over the country's increasing economic woes, brought about in part by skyrocketing world oil prices. The following morning, martial law was declared, the National Assembly (Parliament) was disbanded, and all public meetings of more than three people were banned, with an exception only for funerals. Political speech and gatherings of all kinds were prohibited. Nonetheless, many Korean citizens were optimistic about the change, since they now had a civilian acting president, Choi Kyu-hah, who promised among other things to halt the torture of political prisoners. The moment of sunshine faded quickly, however. On December 12, 1979, Army Security Commander General Chun Doo-Hwan, who was in charge of investigating President Park's assassination, accused the army chief of staff with conspiring to kill the president. General Chun ordered troops down from the DMZ and invaded the Department of Defense building in Seoul, arresting thirty of his fellow generals and accusing them all of complicity in the assassination. With this stroke, General Chun effectively seized power in South Korea, although President Choi remained as a figurehead. In March 1980, a new semester began, and university students and professors who had been banned from campus for political activities were allowed to return. Their calls for reform — including freedom of the press, and an end to martial law, and free and fair elections — grew louder as the semester progressed. On May 15, 1980, approximately 100,000 students marched on Seoul Station demanding reform. Two days later, General Chun promulgated even harsher restrictions, closing down universities and newspapers once more, arresting hundreds of student leaders, and also arresting twenty-six political opponents, including Kim Dae-jung of Gwangju. Outraged by the crackdown, about 200 students went to the front gate of Chonnam University in Gyungju early on the morning of May 18. There they met thirty paratroopers, who had been sent to keep them off the campus. The paratroopers charged the students with clubs, and the students responded by throwing rocks. The students then marched downtown, attracting more supporters as they went. By early afternoon, local police were overwhelmed by 2,000 protestors, so the military sent about 700 paratroopers into the fray. The paratroopers charged into the crowd, bludgeoning the students and passersby. A deaf 29-year-old, Kim Gyeong-cheol, became the first fatality; he was simply in the wrong place at the wrong time, but the soldiers beat him to death. Throughout the day on May 19, more and more furious residents of Gwangju joined the students in the streets, as reports of increasing violence filtered through the city. Businessmen, housewives, taxi drivers — people of all walks of life marched out to defend the youth of Gwangju. Demonstrators hurled rocks and Molotov cocktails at the soldiers. By the morning of May 20, there were more than 10,000 people protesting downtown. That day, the army sent in an additional 3,000 paratroopers. The special forces beat people with clubs, stabbed and mutilated them with bayonets, and threw at least twenty to their deaths from high buildings. The soldiers used tear gas and live ammunition indiscriminately, shooting into the crowds. Troops shot dead twenty girls at Gwangju's Central High School. Ambulance and cab drivers who tried to take the wounded to hospitals were shot. One hundred students who sheltered in the Catholic Center were slaughtered. Captured high school and university students had their hands tied behind them with barbed wire; many were then summarily executed. On May 21, the violence in Gwangju escalated to its height. As the soldiers fired round after round into the crowds, protesters broke into police stations and armories, taking rifles, carbines and even two machine guns. Students mounted one of the machine guns on the roof of the university's medical school. The local police refused further aid to the army; troops beat some police officers unconscious for attempting to help the injured. It was all-out urban warfare. By 5:30 that evening, the army was forced to retreat from downtown Gwangju in the face of the furious citizens. By the morning of May 22, the army had pulled out entirely from Gwangju, establishing a cordon around the city. A bus full of civilians attempted to escape the blockade on May 23; the army opened fire, killing 17 of the 18 people aboard. That same day, army troops accidentally opened fire on one another, killing 13 in a friendly-fire incident in the Songam-dong neighborhood. Meanwhile, inside Gwangju, teams of professionals and students formed committees to provide medical care for the wounded, funerals for the dead, and compensation for the families of victims. Influenced by Marxist ideals, some of the students arranged to cook communal meals for the people of the city. For five days, the people ruled Gwangju. As word of the massacre spread throughout the province, anti-government protests broke out in nearby cities including Mokpo, Gangjin, Hwasun, and Yeongam. The army fired on protestors in Haenam, as well. On May 27, at 4:00 in the morning, five divisions of paratroopers moved into Gwangju's downtown. Students and citizens tried to block their way by lying in the streets, while the armed citizen militias prepared for a renewed firefight. After an hour and a half of desperate fighting, the army seized control of the city once more. The Chun Doo-hwan government issued a report stating that 144 civilians, 22 troops, and four police officers had been killed in the Gwangju Uprising. Anyone who disputed their death toll could be arrested. However, census figures reveal that almost 2,000 citizens of Gwangju disappeared during this time period. A small number of the student victims, mostly those who died on May 24, are buried in Mangwol-dong Cemetery near Gwangju. However, eyewitnesses tell of seeing hundreds of bodies dumped in several mass graves on the outskirts of the city. In the aftermath of the horrific Gwangju Massacre, the administration of General Chun lost most of its legitimacy in the eyes of the Korean people. Pro-democracy demonstrations throughout the 1980s cited the Gwangju Massacre and demanded that the perpetrators face punishment. General Chun held on as president until 1988, when under intense pressure, he allowed democratic elections. Kim Dae-Jung, the politician from Gwangju who had been sentenced to death on charges of fomenting the rebellion, received a pardon and ran for president. He did not win, but would later serve as president from 1998 to 2003, and went on to receive a Nobel Peace Prize in 2000. Former President Chun himself was sentenced to death in 1996 for corruption and for his role in the Gwangju Massacre. With the tables turned, President Kim Dae-jung commuted his sentence when he assumed office in 1998. In a very real way, the Gwangju Massacre marked a turning point in the long struggle for democracy in South Korea. Although it took almost a decade, this horrifying event paved the way for free and fair elections and more transparent civil society. "Flashback: The Kwangju Massacre," BBC News, May 17, 2000. Deirdre Griswold, "S. Korean Survivors Tell of 1980 Gwangju Massacre," Workers World, May 19, 2006. Gwangju Massacre Video, Youtube, uploaded May 8, 2007. Jeong Dae-ha, "Gwangju Massacre Still Echoes for Loved Ones," The Hankyoreh, May 12, 2012. Shin Gi-Wook and Hwang Kyung Moon. Contentious Kwangju: The May 18 Uprising in Korea's Past and Present, Lanham, Maryland: Rowman & Littlefield, 2003. Winchester, Simon. Korea: A Walk Through the Land of Miracles, New York: Harper Perennial, 2005. What Really Happened at the Tiananmen Square Massacre of 1989?